The 9800 Change Part holds a necked-in can in place as it is being pressurized. 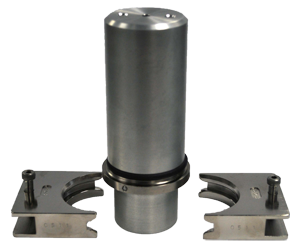 The 9800 consists of a displacement plug over which the can is placed; an optional plug extender for use with a second height of can; and a pair of jaws which clamp the sample in place against the displacement plug during testing. The 9800 is ordered by specifying 9800, the can straight wall diameter, the can necked-in diameter, the can height, and the second height (if applicable).